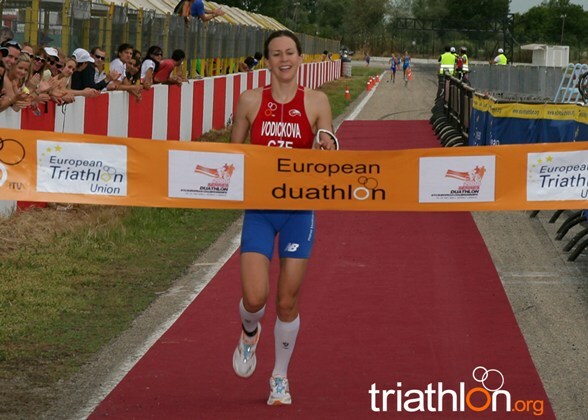 Today Belgian Jurgen Dereere and Radka Vodickova of the Czech Republic were crowned European Duathlon Champions, winning the 10-kilometer run, 40-kilometer bike, 5-kilometer run event in Serres, Greece. In the women’s race, a group of five athletes led at the end of the first run. During the bike this group was joined early by Kaisa Lehtonen from Finland and later Michelle Lee from Great Britain and Beatriz Tome Jimenez from Spain. In the second run, Vodickova was in the lead from the early meters of the secondrun portion and increased her lead until the finish. Vodickova posted the fastest final run split of the day which proved to be the difference as she took the women’s title by a 20-second margin over silver medalist Alexandra Louison of France. Home favourite Deniz Dimaki of Greece delighted the local crowds, taking the bronze. In the men’s race, all eyes were on Belgium’s Joerie Vansteelant, the current Long Distance Duathlon world champion. But after a sluggish opening 10-kilometer run, Vansteelant couldn’t get back into contention and finished a disappointing 11th place. His teammate Dereere, who’s taken silver at the last two Duathlon world championships, had the fastest final run of the field to take the European title, ten seconds over Sergio Silva of Portugal. At last year’s world championships, Silva again finished behind Dereere but has long been considered a rising Duathlon star. In 2006, he won the under23 world championships. Yohann Vincent of France came across the line for the bronze, just five seconds behind Silva. The event featured a 20,000 EUR prize purse for the elite men and women. 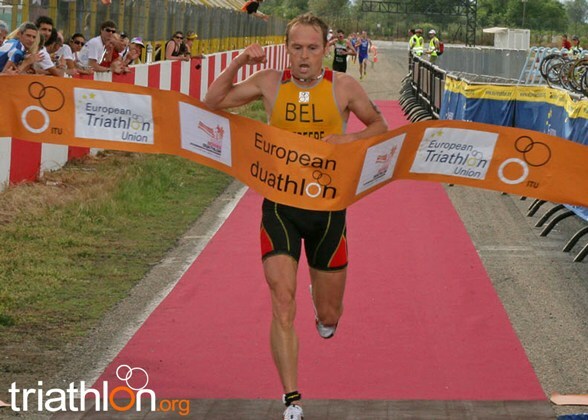 Next year’s European Duathlon championships will be held in the stunning city of Budapest, Hungary, also host city of the 2010 ITU Triathlon World Championships. Also being contested today were men’s and women’s under23 and junior races. Four different countries were on top of the podium as France’s Charlotte Gauchet took the under23 women’s title, Slovak’s Martin Urbanovsky won the men’s under23 race. In the juniors, Sarah Zaborowski of Germany was crowned junior women’s champion while Spain’s Oscar Vicente took the junior men’s title.